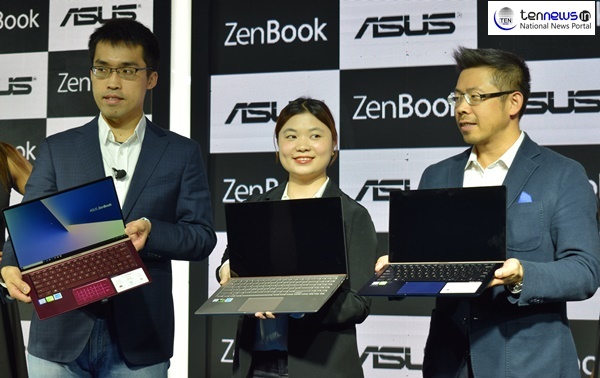 New Delhi (30/01/2019) : ASUS today launched Compact ZenBook laptops series, packing awe-inspiring aesthetics and superb performance.The latest models represent the high tech couture ZenBook laptop series that is world-renowned for its beautiful, thin-and-light minimalist designs. “Today yet again, we are extremely proud to launch the Worldfs smallest laptop’ without comprising on performance and focusing on absolute portability. We are confident that our consumers will love our new Zenbook range priced competitively”, he added. Asus ZenBook 3 is an ultra slim, stylish and powerful Ultrabook that measures 11.9mm in thickness and weighs merely 910 Grams, making it ideal to carry around everywhere. It is powered by latest 6th generation Dual core Intel Core i7 7500U processor, 512 GB SSD and is coupled with 16GB RAM at the speed of 2133 Mhz. It features a 12.5 inch Full HD IPS LED Display with a screen resolution of 1920 x 1080 pixels, a Corning Gorilla Glass 4 panel and 178-degrees viewing angle, which provides for an enriching gaming, surfing and video watching experience. All the above features ensure that you breeze through all your tasks throughout the day. Asus ZenBook 3 runs Windows 10 OS and comes with a VGA webcam for video calling and recording purposes, a gold-backlit keyboard, a finger print reader for enhanced security and a glass-covered touchpad. The connectivity options available on the device are WiFi, Bluetooth, 1 x USB 3.1 slot and 1 headphone/microphone combo. It incorporates a 6 cell battery that keeps the device running for upto 9 hours on a single charge. The battery supports quick charging technology so that 60 percent charge can be achieved in 49 minutes. On the memory front, the laptop is equipped with a hard drive of 512 GB and a 16 DDR3 RAM, thereby making it possible to store ample amount of data. All the above features ensure that you breeze through all your tasks throughout the day. The ZenBook series has always been about balancing its incredible beauty with unbelievable power, and the new ZenBooks are no exception. The new models feature a full complement of the best high performance components including the latest 8th Generation Intel Core i7 quad-core CPU, up to NVidia GeForce GTX 1050 Max-Q graphics, 16 GB Ram and ultra fast PCIe SSDs and the fastest available gigabit class Wi-Fi.